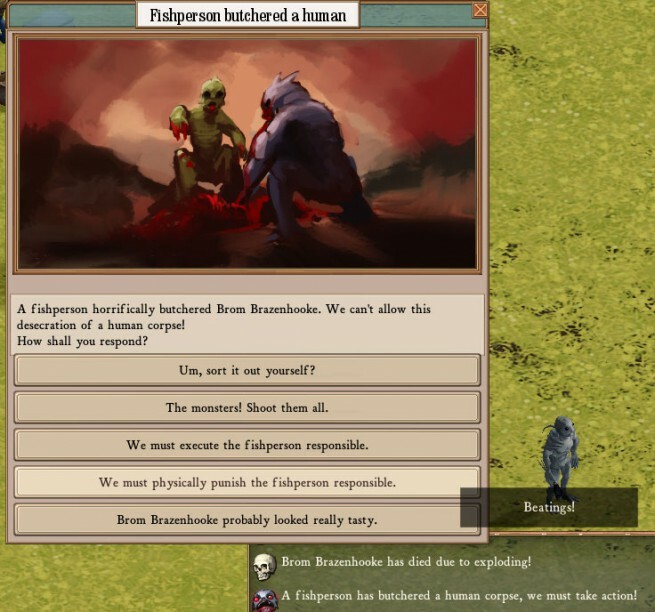 – The Clockwork Empires game simulation! (Thank you, Academician Prokhor Zakharov.) Specific acts in the simulation itself may provoke crisis events. Crisis events allow a player to change their settlement’s policy toward certain factions. I’ve talked about this subject before a little in “Event Design Using Twine”. 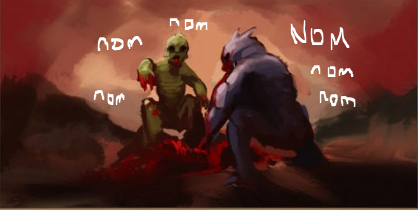 Let’s pull a newly implemented example: A Fishperson finds a source of meat and butchers that meat, then consumes it. Perfectly natural, but in conflict with the pseudo-Victorian values of the player’s faction. What do you do? Fishpeople interactions are especially complex because they do form a human-recognized political body with which there are protocols and lines of communication, nor do they have much notion or care for human values. Of course, each Faction has unique considerations. Then there are Certain Eldritch Things Which Must Not Be Named that may be totally unconcerned with human politics. But human politics are very concerned with tapping the power of Certain Eldritch Things, to say nothing of cults that may form with the goal of worshiping/summoning one or another Thing. Or maybe just partying. Cults, right? Back to Fishpeople and tying it all together: Human will come into play because your NCO might support a policy of war rather than one of denial, a romantic Poet may propose peace because war is so terrible, while the Vicar would be content to try to pretend they don’t exist at all. 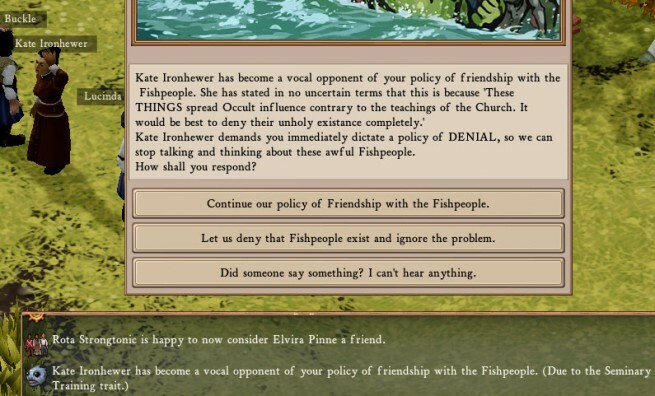 With this, the official policy the player chooses toward Fishpeople can be questioned – and changed – because it conflicts with the personality of certain colonists. This ties together fishpeople, global policies, and personality traits. Making these game systems all inform and interact with one another is really exciting because it sets up great chains of causality through the simulation, over to the player, then back into the simulation! 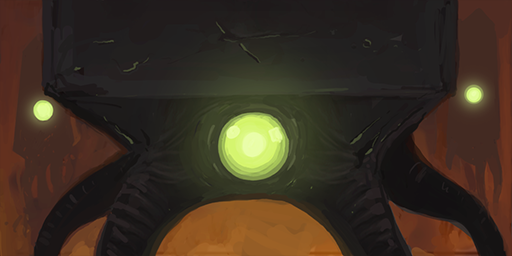 We’ll be adding more faction & event content (alongside systems upgrades & things we’re not even talking about yet of course) in upcoming patches. Posted in Clockwork Empires	| Tagged morbo cares not for your earthling politics, people just don't respect the title of academician like they used to, the global policies are secretly a tie-in to the upcoming days of our lives season involving fishpeople and messages from beyond the stars, the subtitle for every option is beatings, voted "most likely to succeed the throne beneath the waves"
In the past few games i’ve enjoyed an uneasy peace amongst the fishpeople, even though they still seem to have an aversion to my crops for some reason. They won’t attack my colonists, but i’ll get the occasional message that they’ve destroyed a crop or two. Thankfully I was knee deep in pickled fungus and berries when it happened, so I didn’t think much of it. Perhaps they just really, really don’t like cabbage. Wait, so he exploded first and the fishpeople did a service to the kingdom by eating the corpse? Sounds like they should have gotten a medal. Of course Eldritch Horrors are concerned with human politics. How else will they completely eradicate all of cabbage kind!? There is a citizen stuck in a module in a church. It happens quite often. The citizen will either starve to death and turn into a murderer or get unstuck somehow.